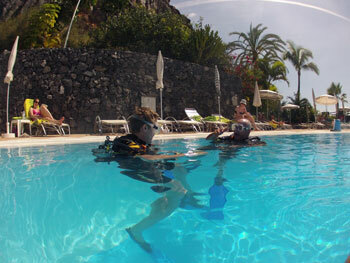 Splash Gomera Diving and Watersports Centre is in the grounds of the Hotel Jardin Tecina in their Club Laurel beach club. To find the shop is easy. If you are staying in the hotel you take the lift from the main part of the hotel down to Club Laurel, which is at the base of the cliffs. The way is well signposted within the hotel. If you are coming to us from the village you will find us at the base of the cliffs on the Eastern end of the beach, that’s to the left as you look out to sea. Follow the road alongside the beach, cross over the small bridge, turn right towards to sea again go past the two beach bars, La Chalana and Tarajal, and follow the road to the end where you will find a parking area. Follow the sign to Club Laurel restaurant, enter the gate beside the swimming pool, walk through the restaurant and we are on the raised terrace behind the bar. You can also find us on Google Maps 'Splash Gomera'. Click on the pin and then click on the directions button and follow the map. Call (0034) 626 658 901 from 09:00 until 20:00.